Champagne in any form is an elegant drink, whether served in a tall, crystal flute or an inexpensive coupe. But do you have to spend a fortune to acquire it? Absolutely not! Unless you have a sophisticated palate that can tell the difference between cheap champagne and sparkling wine from their more expensive counterparts when you have something to celebrate, save your money. Champagne doesn't have to be expensive to be delicious. Nor does it have to originate in France. Those in the know say that the major differences between inexpensive libations and bottles that cost many dollars are that cheap champagne and sparkling wine are generally sweeter than the expensive variety, and bubbles in cheap champagne tend to be bigger and more bubbly. Whether you drink chilled champagne straight or mixed in a cocktail such as a brunch-time mimosa or a blush-toned kir royale in the evening, try the following cheap but tasty ones that can stylishly elevate any ingredient and every event. This sweet and super-cheap sparkling wine is made from Muscat grapes grown around Asti, which is a town in Italy. Ballatore Gran Spumante won a Double Gold Medal at the California State Fair Wine Competition and has subsequently picked up multiple other awards. A cheap champagne with a lot of personality, non-vintage Dom Ste Michelle Blanc de Blanc from Washington was deemed a best buy by Wine Spectator magazine. Discriminating palates will detect pear and spice flavors. Francis Ford Coppola makes great movies, so why not great wine? The "Godfather" director has released this fruity blend of pinot blanc, Muscat, and Riesling grapes and added champagne-like sparkle. The romantic in us appreciates that it comes wrapped in peony-pink cellophane. For the complete experience, sip a Coppola wine at one of his resorts, such as the 10-casita La Lancha in the Guatemalan rainforest. Less sweet than the Ballatore Gran Spumante, Freixenet Carta Nevada Brut is a varietal cheap champagne that comes from Spain and combines Macabeo, Xarel-lo, and Parellada grapes. It is produced by the méthode champenoise method, which requires double fermentation. Still less sweet than the Freixenet Brut, this cheap méthode champenoise champagne has a clean, sparkling taste with a hint of fruit flavor sweetness. Cheap but classy, crisp and dry, Cristalino from Spain is fast becoming the champagne choice of budget-conscious brides and party-givers. If you prefer cheap champagne from California, you can't do much better than the pale gold, award-winning Mumm Cuvee Napa Brut Prestige, which is extremely bubbly. You don't need to travel all the way to Venice to savor the flavor of a Bellini. Purists only serve it during months when peaches are in season, combining their nectar with champagne. This naturally fermented beverage is pre-flavored with almond and peach flavor added, although it's not overly sweet. It's a popular and affordable (okay, cheap) choice to serve at weddings. Prosecco is Italy's version of champagne, and many sophisticates enjoy it in spite of, or because of, its cheap price. Mionetto is the country's largest producer of prosecco and produces several different varieties, all of them cheap at less than $20. The taste is dry with an intense fruity bouquet. Less than $20 gets you a bottle of this bubbly, which comes from the heart of Italy's Prosecco region. The taste is described as "fresh and clean, with ripe citrus, lemon, green apple, and touches of grapefruit, minerals, and some toast." It's not champagne, it's not wine, and it's not free, but it does sparkle and it is cheap. 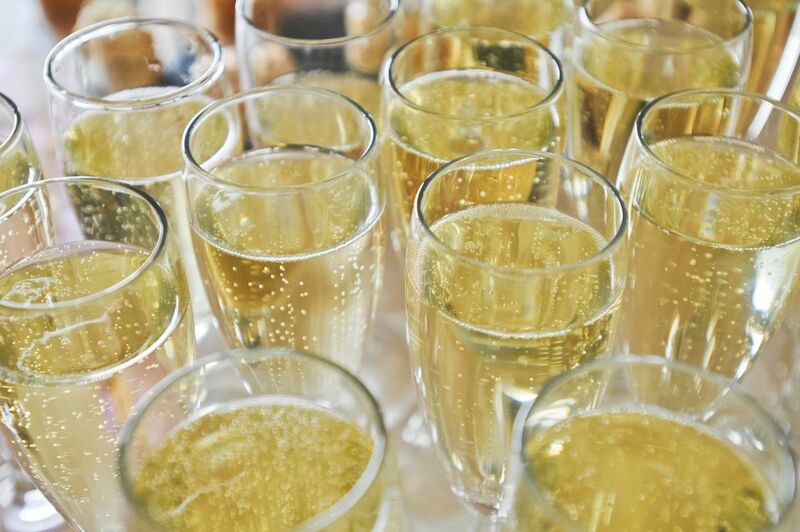 As a non-alcoholic alternative to celebrate with, Fre Brut gets high marks for its pleasing taste, tiny bubbles, effervescent fizz, and dry finish. Last, but certainly not least—and absolutely not cheap—Perrier Jouet Brut in the Flower Bottle is the champagne to bring out when you want to romance and impress someone. The gorgeous bottle is covered in an Art-Deco design with anemones that may become a keepsake of a memorable evening. It is sometimes sold in a gift box with commemorative champagne glasses. Drink up!